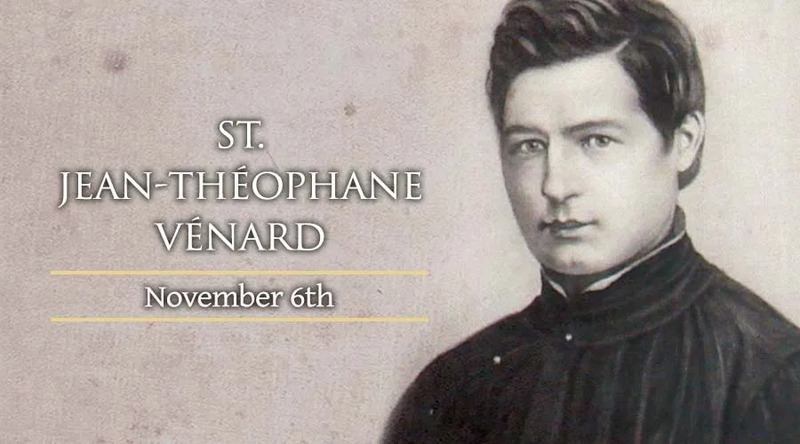 On November 6, the Church celebrates the feast of St. Jean-Théophane Vénard, a French missionary to Vietnam who was martyred for the faith. Famous for having inspired St. Therese of Lisieux, who said of St. Jean-Théophane that he was someone who had lived her own image of a martyr and missionary, St. Jean was born in France, became a priest in the Society of Foreign Missions, and was sent to Vietnam. Due to the persecutions of the anti-Christian emperor Minh-Menh, priests were forced to hide in the forest and live in caves. They were able to sneak out at night and minster to the people. Eventually someone betrayed St. Jean, and he was arrested. During his trail, he refused to renounce his faith in order to save his life. He was condemned to death, and spent the last few weeks of his life locked in a cage. It was during his incarceration that he wrote many letters, some to his family. His most famous line is from a letter to his father in which he said, “We are all flowers planted on this earth, which God plucks in His own good time: some a little sooner, some a little later . . . Father and son may we meet in Paradise. I, poor little moth, go first. Adieu." In reading these letters, St. Therese the Little Flower came to understand and use the image of being a little flower, whom God nevertheless cared for and cultivated, despite her minute size. St. Jean-Théophane Vénard was beheaded Feb. 2, 1861. His severed head was later recovered and is preserved as a relic in Vietnam. The rest of his body rests in the crypt of the Missions Etrangères in Paris.